Little Harvest Mouse loves his friend the moon. But one cloudy night, when he comes outside, the moon has vanished! 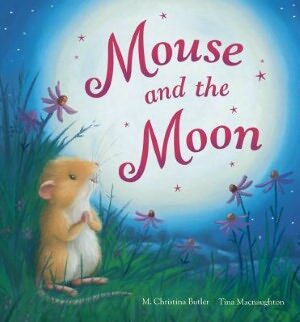 With the help of several of the moon’s other woodland friends, Harvest Mouse tries to track down the moon–in the pond, in a tree, even in the mountains. As a thunderstorm begins to rage, Harvest Mouse wonders if he will ever see his friend the moon again. This friendship story has big, beautiful illustrations and would be great for a preschool bedtime story or storytime. It could easily be paired with Frank Asch’s Happy Birthday, Moon and/or James Thurber’s Many Moons.